Americans are spending more than even to dine out or to use fast food delivery services. 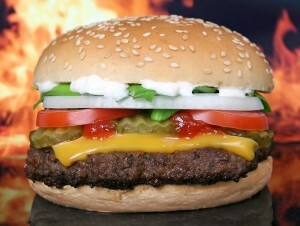 Furthermore, they are more demanding when it comes to their fast food quality and variety. These demands are especially higher when we think of food titans such as Burger King, KFC, and McDonald’s. Surveys show that many people think that their food quality is important. Also, the convenience of the dining location is a key element, as well as if the food provider offers fast delivery services. These could be some of the reasons the traditional fast-food chains are losing their edge: younger diners could be willing to go out of their way to get a tasty meal. Sometimes doing the grocery shopping and cook a meal from the scratch just isn’t an option. Many people are extremely busy with work, study, home, children, etc. Or maybe cooking is not their thing. An increasingly popular alternative is to use a meal or fast food delivery service. There are plenty of option out there: from fast and easy-to-make recipes to fabulous chef-inspired dishes. These services often offer meals with a predominant focus on the protein component, having almost nothing when it comes to vegetables. They suggest you add salads or vegetable side dish, some of them even offer these to buy. However, this will obviously raise the total cost. One must keep this in mind when comparing meal prices. Some offer a good selection of freshly prepared, chilled meals while others sell predominantly frozen meals. If this difference is important to you, pay close attention to what they are offering before you place the order. Big chains such as Chipotle, Noodles & Company, and Panera have all started to offer meat that is produced without the use of antibiotics in the animal feed, an attraction for many health-conscious consumers. When you get past the big important competitors on the market, you will find many fine national and local restaurants such as In-N-Out Burger, Jason’s Deli, Papa Murphy’s Take ‘N’ Bake Pizza, Portillo’s Hot Dogs, and The Habit Burger Grill. Stick to the right ratio: 50% vegetables, 25% protein, 25% carbohydrates. This is a balanced meal. Avoid oils, cream, and other sauces full of fats. Choose tomato sauce instead. If you get an all-protein dish like a chicken stir fry, also order an all-vegetable dish. Ask, if possible, for less salt and sugar to be used in your meal. Ask your local takeaway what kind of oil they use in their cooking. Avoid those that use oils high in saturated fat such as coconut or palm oil, and stick to those that use vegetable oils such as sunflower or canola. The best kind of oil is olive oil. The less processed, the better. Do not overdo the carbohydrates. A takeaway container of noodles, pasta or rice is likely to contain much more than you should eat. Choose brown rice or whole grains, when possible. Steamed or grilled dishes are better choices than fried ones. The fast food industry is quickly adapting to new modern life, and new technology, from mobile ordering to the rise of delivery apps. Dunking’s delivery service is on the menu for 2016. It will have a mobile app and the chain plans to use a third party to carry out the delivery. Seems that the chain has been testing delivery services since June 2015. This big food chain began delivery in New York, Los Angeles, and Chicago in September 2015. They use an online and app-based delivery company DoorDash. Delivery is already planned to become available in other big cities such as Washington D.C., Boston, and more. In the 7-Eleven fast food delivery service, dishes such as chicken wings are available. However, the famous Slurpee will remain off the menu until the company figures out a way to deliver it in its initial frozen form. With the company reporting a 30 percent month-over-month growth in delivery orders, Chipotle began delivering orders in select areas as well. To have an impact in the school year that started in fall 2015, the chain has partnered with Tapingo, a mobile commerce app that is specially created for college students. This means that Chipotle fast food delivery services are now available at 40 college campuses nationwide. Starting spring 2016, the chain began to deliver to more than 100 campuses. Forget going to the mall or passing by through the airport. From August 2015, you can order a single Auntie Ann’s pretzel to your home if you are willing to pay the delivery fee of at least five dollars. The chain has added or plans to add delivery service in 34 locations in Austin, Atlanta, New York, San Francisco, Dallas, Portland, Charlotte, and Los Angeles. In August 2015, Carvel started delivery services in the same cities as its sister company, Auntie Ann’s. this chain is 80-year old but has managed to keep up with modern times. Carvel is best known for its sundaes and ice cream cakes. Carvel promises, through their delivery company, 60 minutes waiting time, for all its products. This is a key element when it comes to fast food delivery service, especially to easily meltable snacks. To further ensure the frozen nature of Carvel deliveries, the delivery company will use a car instead of a bike, as well as hot and cold bags to keep items at their initial temperature. 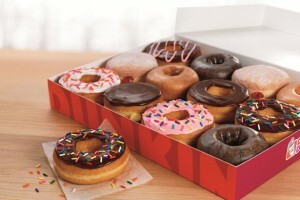 Cinnabon’s motto, when it comes to delivery services, is “bringing a little tech into our sweet and snacky food biz”. Cinnabon is also owned by Focus Brands, along with Auntie Ann’s and Carvel. In July 2015, Taco Bell launched fast food delivery service at more than 200 restaurants in California and Texas. The delivery service is available through the DoorDash website and apps. They are also testing delivery services near campuses. Taco Bell also stated that KFC, their sister company, might also consider the possibility of delivery in the near future. 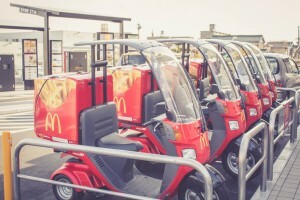 In May 2015, McDonald’s began offering fast food delivery services in New York City, through a third party company. This phase is important for the chain, being part of a future development of the company. However, this is also an effort of the company to revitalize its image. In March 2015, the coffee chain announced it was testing two delivery models in two cities: Seattle and New York City. Their delivery system is based on a mobile app. In conclusion, fast food delivery is not a matter of bad or good, but it is a matter of taste, efficiency, and services quality. Luckily, more and more companies are entering the meal delivery business, which means people will have plenty of options to pick from. Hey Buddy!, I found this information for you: "Best Fast Food Delivery Services – A Consumer’s Guide". Here is the website link: https://all2door.com/fast-food-delivery-services/. Thank you.